Before automated rules existed, an advertiser will periodically check on the performance of her/his campaign in order to make edits based on campaign performance. Now, these edits can be made automatically using Facebook’s automated rules. What are Facebook’s Automated Rules? Automated rules make it easier to change campaign settings and to automatically edit your campaigns, ad sets or ads based on the criteria you set. For example, you can create an automated rule that will automatically stop an ad based on the value of its Click Through Rate (CTR) or you can create an automated rule that will automatically increase your daily or lifetime budget based on your average Cost Per Result (CPR). Automated rules are used by top marketers to automatically stop under-performing ads and boost top-performers without being stuck to their campaign dashboards all the time. If you want to automate your Facebook Ad optimization then you want to go with automated rules. Before we start creating automated rules, let’s first identify the parts needed to create one. Trigger – The trigger is the condition that needs to be met before the rule is initiated. Action – This is the action/edits that are executed when the condition is met. Asset – This is the item that is going to receive the action. This can be an ad, an ad set or a campaign. The criteria/trigger for a rule is known as the “condition”. The rule will execute only when the condition is met. You can decide to set a condition where the rule will only be executed if the amount spent (is greater than) $50. The part of the condition in the bracket is called the logical expression. Facebook allows four types of logical expressions. Not all actions can be applied to every asset. Budget and bid adjustment actions cannot be applied to an ad or a campaign, it can only be applied to an ad set. What is Ad Scaling for Facebook? Facebook Ad scaling is simply the increase in advertising spend on top performing campaigns in order to increase sales while monitoring the overall performance of the campaign. In eCommerce, ad scaling is essential to driving sales and increasing ROI (Return On Investment). A well thought out process must be developed before you start scaling your ad. This process is called the ad scaling plan/strategy. There are two important questions you need to ask before you decide to scale your ad. The first is: “Do I have enough data in my Facebook pixel?”. For website conversion ads, the Facebook pixel needs to gather enough data to be able to effectively optimize your ad. To optimize for a particular conversion event, Facebook recommends your ad gets 50+ of that conversion in a week. If you are optimizing for the “Add To Cart” event, your ad set needs to get 50 “add to cart” conversions in a week. This will enable your pixel to collect enough data so that the delivery system will know who to show your ad to. The second question is “How much am I willing to spend?”. It is recommended that you let your profit margin inform your maximum bid. It will guide you in setting a bid that will not make you run at a loss. The answer to this question will also help you determine your scaling plan and how far you can scale your budget to. What Ad scaling plan should I adopt? There are numerous ad scaling plans developed by marketing experts. Facebook experts like Ben Malol break ad scaling into two main categories: Slow scaling & Fast scaling method. Some experts recommend a slow scaling method which involves a 20% increase in budget after every 3 days. For example, if your winning campaign has a budget of $10, increase it to $12 and wait for 3 days. If the campaign continues to perform well, increase the budget to $14.4 and repeat the process until you get to your maximum daily budget. This plan is recommended for new/small stores that have a small advertising budget and meet the minimum conversions data criteria of 50 conversions a week. Other experts recommend a quick scaling method which is done by multiplying the number of purchases with your previous budget to get your next budget. For example, if your initial budget was $5 and you received 3 purchases after 4 days, then 3 * 5 = $15. Your next budget according to this scaling plan will be $15. This plan is recommended for old/bigger stores that have a bigger advertising budget and have a lot of data in their Facebook pixel. When it comes to scaling your Facebook ads you will need to experiment and test a lot. Test with low budgets to identify the winning formula. How to create a Facebook automated rule for scaling your ads? Now let’s automate our Facebook ad scaling by creating an automated rule. 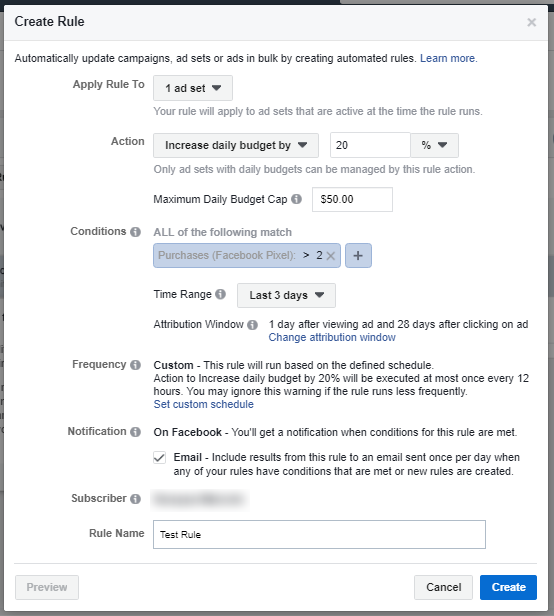 You can access Facebook’s automated rules inside Power Editor or Ads Manager. I will be using Ads manager and the slow scaling method in the example below. “Scaling Plan – Increase the budget by 20% when ad receives > 2 purchases”. 1. 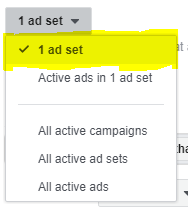 In your Ads manager, click on the campaign you want to edit and click on the Ad sets tab. After that click on the Create Rule button to create an automated rule. 2. After clicking on the Create Rule button, you will receive a dialogue as shown below. 3. Click on the “Apply rule to” drop down and select the asset you want this rule to apply to. You can choose to apply the rule to all active ads, ad sets or campaigns. In this example, we will be applying the rule to the selected Ad set. So click on “1 ad set”. 4. To add an action, click on the drop down and on “Adjust budget”. Select “Increase daily budget by” and set a percentage value of 20. It is advisable to set a maximum cap. This will prevent your budget from exceeding what you are willing to spend. I am using $50 as the cap on the daily budget. 5. Now let’s create our condition. Applying the scaling plan as described above, we will create the first condition which requires the ad to get 2 purchases. In the conditions text box, click on the first tag in the box, next click on “Website Conversions (Facebook Pixel)” category. Under the “website conversions” category, select “purchases”. 6. Click on the middle tag to select a logical expression. Select “is greater than” as the logical expression and set the value to 2. After putting in the right values, click on “Apply”. 7. Next, you will have to tell Facebook the data range to use for the rule. After every edit, you should let your ad run for at least 3 days to ascertain if the changes were effective or not. Select 3 days as the data range. 8. Next, set the days and the number of times you want this rule to run. 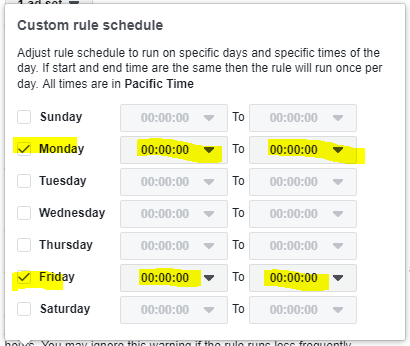 Click on “Set custom schedule” and adjust to make the rule run on specific days and times. The rule will execute once a day if the start time and end time are the same. Select Monday and Friday and set the time to midnight. This means your rule is going to execute once every Monday and Friday at midnight. 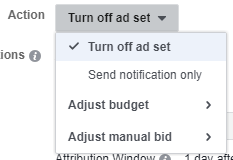 It is recommended that all changes to your ad should be made at midnight to enable Facebook to optimize the spending of your budget for the entire day. 9. You will automatically be notified on Facebook when the conditions of your rules are met. Check the box to receive email notifications. After setting up your rule, click on the “Create” button and your rule will be up and running. You can add multiple conditions to your rule. Your ad will have to meet all conditions before the rule will be executed. Bonus – Facebook ad scaling plan template download. We are giving away a free access to a Facebook ad scaling plan developed by our in-house Facebook ad experts. This Facebook ad scaling plan is based on your profit margin and the number of purchases. Here is a link to our*** Facebook ad scaling plan***. Make a copy of this template inside your Google drive or download it in order to use this template. Facebook as an advertising platform is always getting better with the addition of new tools and features. As an eCommerce merchant, you must learn to take advantage of these features to get the most out of your Facebook ads. Facebook’s automated rules is just one of the many features that can help you maximize your returns. To learn more about Facebook ads, SEO and anything that will help you succeed as an online merchant, subscribe to our blog.